Macau (Macao SAR) – September 11, 2018 (travelindex.com) – The Global Tourism Economy Forum (GTEF or the Forum) continued its China roadshow and promoted GTEF 2018 at the 2018 China (Guangdong) International Tourism Industry Expo (CITIE 2018) in Guangzhou from September 7 to September 9. 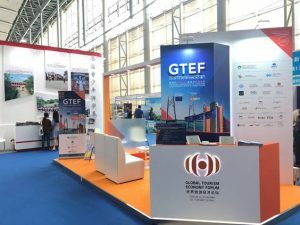 Capitalizing on the CITIE 2018 occasion, GTEF introduced the Forum as an international tourism platform that connects the Greater Bay Area, the Belt and Road countries and the rest of the world. GTEF also put forth its 2018 edition, including its Official Partner capacity in the 2018 EU-China Tourism Year (“ECTY2018”), EU as the Partner Region, and Guangdong Province as the Featured Chinese Province with a special focus on the burgeoning Guangdong-Hong Kong-Macao Greater Bay Area. At the expo, GTEF held meetings with major public and private tourism entities to exchange views, deepen mutual understanding and explore collaboration possibilities. Visitors at GTEF’s booth were engaged in interactive games that are designed to increase their understanding of the Forum and encourage them to join GTEF 2018. The highlight of the latest GTEF roadshow was the networking dinner “CITIE Night powered by GTEF” at the Garden Hotel Guangzhou on September 7. Co-organized by CITIE and GTEF, and supported by Tourism Administration of Guangdong Province, the dinner was designed to foster exchanges approximately 100 tourism leaders, exhibitors and media representatives. Ms. Zeng Yingru, Director General of Guangdong Province Tourism Administration, delivered a welcome speech on behalf of CITIE. Mr. Jason Wang, Chief Operating Officer of GTEF, briefly introduced GTEF 2018’s theme and invited industry peers to take advantage of the business matching offerings uniquely provided in the 2018 edition. Insightful Macao tourism business outlook was presented by GTEF’s major sponsors and integrated tourism and leisure enterprises in Macao, namely Ms. Aileen Lu, Regional Sales Manager of Galaxy Entertainment Group; Ms. Cindy Yang, Account Director – Resort Sales of MGM Macau; Ms. Ling Shi, Hotel Sales Manager of Sands China; Mr. Bailey Sin, Marketing Director of SJM Holdings Limited; Mr. Dicky Lei, Senior Manager-Sales of Wynn Palace; and Ms. Kiki Wan, Manager-Sales of Wynn Macau. GTEF 2018 will be held at MGM COTAI on October 23 and 24, under the theme “Strategic Partnership in a New Era, Rising Momentum for a Shared Future”. Featuring EU as the Partner Region and Guangdong Province as the Featured Chinese Province, GTEF 2018 will explore how collective efforts between the EU, the second-most popular destination for outbound Chinese tourists outside Asia, and the Greater Bay Area in Guangdong Province, soon-to-be the seventh largest economic bloc in the world, can create a new catalyst for global economic growth. In addition to thought-provoking panel discussions, GTEF will also offer tourism promotion, investment and cooperation opportunities through bilateral trade meetings, business matching, networking, workshops, exhibitions, etc.